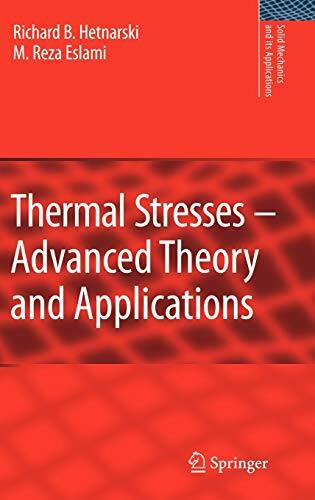 [PDF] Thermal Stresses -- Advanced Theory and Applications (Solid Mechanics and Its Applications) | Free eBooks Download - EBOOKEE! Description: The book is intended as an advanced modern textbook and reference handbook on the topic of Thermal Stresses. It should serve a wide range of readers, in particular, graduate students, candidates for PhD degrees, professors, scientists, researchers in various industrial and government institutes, and engineers working in Mechanical, Civil, Aerospace, and Nuclear Engineering. Thus, the book should be useful to those working or interested in diverse areas of Applied Mathematics, Continuum Mechanics, Stress Analysis, and Mechanical Design. As the field of Thermal Stresses lies at the cross roads of the Stress Analysis, Theory of Elasticity, Heat Conduction, and advanced methods of Applied Mathematics, all these areas are covered in the book to the extend they are necessary. Thus, the book is self-contained, so that the reader should not need to consult other sources while studying the topic. The book starts from the basic concepts and principles, and these are developed to more advanced levels as the text progresses. Nevertheless, some basic preparation on the part of the reader is expected in Classical Mechanics, Stress Analysis, and Mathematics, including Vector and Cartesian Tensor Analysis. No comments for "[PDF] Thermal Stresses -- Advanced Theory and Applications (Solid Mechanics and Its Applications)".